As KPL kicks back into gear after a late winter hibernation, so too does the Alco-beast arise from it's slumber with a slew of new releases. This week sees the first new music releases of 2012 from veteran DIY indiepop label Alcopop! With a single from Freeze The Atlantic (reviewed here at the beginning of February) and the second EP from The Social Club. On the not so distant horizon (coming over a hill you could say) however is this monster release from Oxford rock quartet Gunning For Tamar. Staying with the Alcopop! 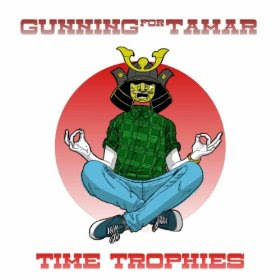 tradition of ensuring records have a quirky physical aspect, the Time Trophies EP comes as a bright orange wrist-watch – it's relation to the EP title self-apparent – but it's the music that's of concern here. And what strikes about the it is that it seems much more suited to Alcopop! 's sister label Big Scary Monsters than it does to the pop bands we know and love. For fans of the label think along the lines of Jumping Ships and LightGuides rather than My First Tooth, for the uninitiated think of crunching but smart rock music with brave instrumentation and an emotive bent. The first and title track sets this out well with the progressive tenancy to shift between rhythms and textures underneath the melodic lead guitar motif. There's hints of Foo Fighters appeal in the end section too, which doesn't harm GFT's prospects. The emo-leaning vocal may put off some who are more indiepop-inclined, but this remains a more than decent rock number that brings new ideas to the table. 'Chocolate Hooves' is up next with a less guitar driven intro acting as a misnomer for the riffy choruses. With this quiet-loud structure it's certainly catchy, if somewhat disposable between 'Time Trophies' and the EP highlight. The piano and bass intro on 'Astronaut-Abort' hints at a more pop appeal and enables GFT to reach greater heights. The vocal is toned down whilst retaining it's distinctive character and in messing with the instrumentation they allow everything to breathe. The tinkling of the keys combined with the spacious and rolling drums lends this a post-rock feel that's more than welcome. Closing proceedings is the Maybeshewill remix of 'Time Trophies'. Whist normally a remix would fail to add to anything other than minutes to the running time, this again gives the group another dimension, bringing the title track to the forefront of the mind whilst looking at it a completley different way. But that's what remixes are supposed to do, right? Well, it just does to show how many get it wrong. This is snappy and electronic with a stripped down feel. Quite good, in other words.